Astrid Skjerven is Professor in design theory at The Department of Product Design, Faculty of Technology, Art and Design, Oslo and Akershus University College of Applied Sciences, Norway. Janne Beate Reitan is Associate Professor in art and design education at The Department of Art, Design and Drama, Faculty of Technology, Art and Design, Oslo and Akershus University College of Applied Sciences, Norway. Culture as an aspect of sustainability is a relatively new phenomenon but is beginning to attract attention among scholars and policy makers. This series opens up a forum for debate about the role of culture in sustainable development, treating culture and sustainability as a meta-narrative that will bring together diverse disciplines. 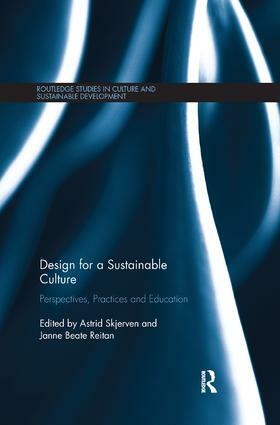 Key questions explored in this series will include: how should culture be applied in sustainability policies; what should be sustained in culture; what should culture sustain; and what is the relationship of culture to other dimensions of sustainability? Books in the series will have a variety of geographical foci and reflect different disciplinary approaches (for example geography, sociology, sustainability science, environmental and political sciences, anthropology, history, archaeology and planning). The series will be addressed in particular to postgraduate students and researchers from a wide cross-section of disciplines.